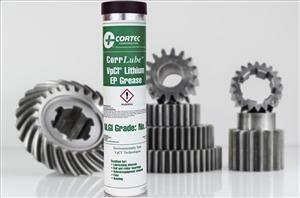 Cortec's CorrLube VpCI Lithium EP Grease offers lubrication enhanced with superior corrosion protection for bearings, fans, chassis or other metal areas where grease is applied -even for use on electrical connections. CorrLubeVpCI Lithium EP Grease is a lithium complex grease formulated with premium quality, severely hydro treated base stock. It provides resistance to oxidation and has high temperature stability; it is suitable for both operating and lay-up conditions. This lubricant's formula is specifically designed with superior corrosion inhibiting properties against salt water, brine, H2S, HCl, and other corrosive agents. In addition, it incorporates Vapor phase Corrosion Inhibitors (VpCI) for areas not in direct contact with the grease. Advantages of CorrLube VpCI Lithium EP Grease include a cleaner application experience with decreased dripping and spattering. It lubricates for longer periods of time and increases the effectiveness of seals to keep out contaminants. This is an excellent product for use on equipment that operates intermittently. CorrLube VpCI Lithium EP Grease remains effective even in extreme operating conditions (i.e., high temperature, high pressure, low speed/high pressure, and shock loading) and aids in the suspension of solid additives such as graphite, molybdenum, disulfide, etc. Its thicker film consistency allows it to operate on worn parts, provide surface protection against movement, and reduce noise level. CorrLube VpCI Lithium EP Grease has been under use by a major mining equipment manufacturer in Finland. Cortec's representative was able to offer CorrLube VpCI Lithium EP Grease as a effective product that would meet requirements of a dielectric test while being flame retardant (control boxes are located in mining equipment where burning chemicals cannot be used). Test results according to the ASTM D149 Dielectric Strength and Breakdown Voltage method exceeded expectations. The product was applied to vulnerable areas from a custom-designed tube at different coating thicknesses, depending on the extent of an area's corrosion exposure. Excellent results were obtained in the field. Cortec CorrLube VpCI Lithium EP Grease was easily applied, easily removed, and continues to give long lasting reliable performance. RENOLIT is offering new and innovative alternatives to conventional paintings. Especially the antifouling film RENOLIT DOLPHIN S is setting new standards in the market.